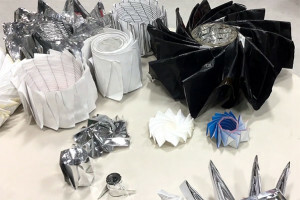 An ancient art form has taken on new shape at NASA’s Jet Propulsion Laboratory in Pasadena, Calif.
Origami, the Japanese tradition of paper-folding, has inspired a number of unique spacecraft designs here. It’s little wonder that it fascinates NASA engineers: origami can seem deceptively simple, hiding complex math within its creases. Dampening the brightness of a star’s light would extend the capability of a space telescope to detect orbiting exoplanets. One future project being considered for possible use with Starshade is the Wide Field Infrared Survey Telescope, which will employ a special coronagraph to image larger planets around other stars. If a Starshade is flown, combining it with WFIRST would allow it to detect smaller planets, too. Something that big is more at risk of micrometeorite strikes; any punctures could mean light getting through and obscuring a telescope’s vision. That’s why JPL turned to an origami-inspired folding pattern, said Manan Arya, a technologist working on Starshade. “We use multiple layers of material to block starlight, separated by some gaps so that, if we do get hit, there’s a good chance that there won’t be a line-of-sight puncture,” Arya said. “A huge part of my job is looking at something on paper and asking, ‘Can we fly this? '” Arya said. He could be considered Starshade’s “origamist in chief.” His PhD thesis looked at the use of origami in space superstructures. He’s not alone. Robert Salazar, a JPL intern who helped design the Starshade folding pattern, now works on an experimental concept called Transformers for Lunar Extreme Environments. JPL senior research scientist Adrian Stoica leads the project, which would use unfolding, reflective mirrors to bounce the Sun’s rays into deep craters on Earth’s moon. Once deployed, this solar energy could melt water ice or power machinery. Salazar tests folding designs and materials in a work area littered with scraps, mostly from paper. 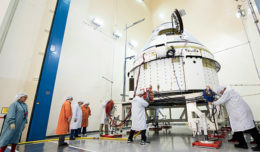 He also folds Kapton, a tinsel-like material used as spacecraft insulation, and a special polyethylene fabric that doesn’t form permanent creases. Some examples of origami designs at JPL. Engineers are exploring this ancient art form to create folding spacecraft. Salazar has been making origami for 17 years. As a kid, he was inspired by the children’s book “Sadako and the Thousand Paper Cranes.” His own original designs include paper animals. In fact, he folds paper versions of endangered species and donates them to benefit wildlife conservancies. 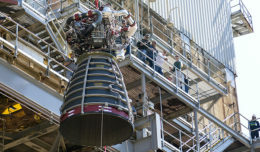 Because they require so little space, mass and cost, they’re easier to launch. But CubeSats are limited in what they can do without folding structures, which can pack antennas and other equipment into them. “That’s an area where I see origami having an increasing role,” Arya said. In July, NASA placed an open call for origami designs to be used in radiation shielding — another sign that the art form has much to offer the future of space exploration.